Today, the Class 3A Greater St. Helens League teams are featured. The Class 4A Greater St. Helens League team notes were posted Wednesday. The Class 2A GSHL teams will follow later Thursday and the Class 1A Trico League team reports will follow. The Prairie Falcons were in a bit of a jam in Week 2, in jeopardy of falling behind by two touchdowns right before the end of the first half. A few minutes later, they were only down by a point. A goal-line stand was followed up by a long touchdown drive, making it 21-20 at the half. Prairie would go on to shut out Washougal in the second half to score 28-21 victory. The Prairie Falcons are 2-0. That’s a big step, too. And in a close game, it was the Falcons who got the job done. Peck pointed out the play of Nolan Mickenham, for his overall game on offense and defense. And he loved the play of his offensive linemen. Going by the scoreboard, the Mountain View Thunder played a near flawless game n Week 2, dispatching Juanita 54-7. The most telling part of this game, at least according to coach Adam Mathieson, came a couple days later. “What I like about our group is they came back to work Monday and Tuesday after the Juanita game. We’ve had our best couple of practices of the year,” Mathieson said. Because even after a 47-point victory, the Thunder players saw that they were far from flawless. “It’s important for them to understand that even if you win by a large score that doesn’t necessarily mean you did all things right,” Mathieson said. Assistant coaches reported to the head coach that the players knew this even before the coaches had a chance to tell them. “Numerous kids were coming up to their coaches, saying, ‘Oh Coach, on play 12 I did this. On play 22, I should have done this.’ The ability to analyze and self correct, for this early in the season, is really good for this group,” Mathieson said. As far as the Juanita game, the coach was thrilled with the team play. Seven Thunder players found the end zone. “We got production from a lot of areas,” Mathieson said, also highlighting the play of the offensive line. Just before the half, Mountain View executed on a perfect 2-minute drill. The Thunder used all three timeouts, plus went out of bounds to save seconds. Then Aiden Hargrove drilled a 35-yard field goal on the final play of the half. Defensively, Mathieson pointed out the play of new starter Nakoa Dizon. Filling in for an injury, the defensive end was instrumental in stopping Juanita’s double-wing attack. “He did a great job, a newbie to the group,” Mathieson said. The Evergreen Plainsmen were hungry for a win, especially after just missing a victory in Week 1. They went to work in Week 2 and got it done. The key for the Plainsmen in Week 2 was finishing on scoring opportunities. In Week 1, they left too many drives short of the scoreboard. That was not the case against Centralia as the Plainsmen put up 47 points. “Once we settled down and focused and started to execute, then we started having success,” Hyde said. The coach credited the offensive line. That is two weeks in a row of 400 yards of offense, Hyde noted. He specifically pointed out Kevin Munoz, who absolutely crushed his opponents when pulling on trap plays. On defense, Hyde noted the play of Jarrin Hunter, who played well all over the field as a linebacker. 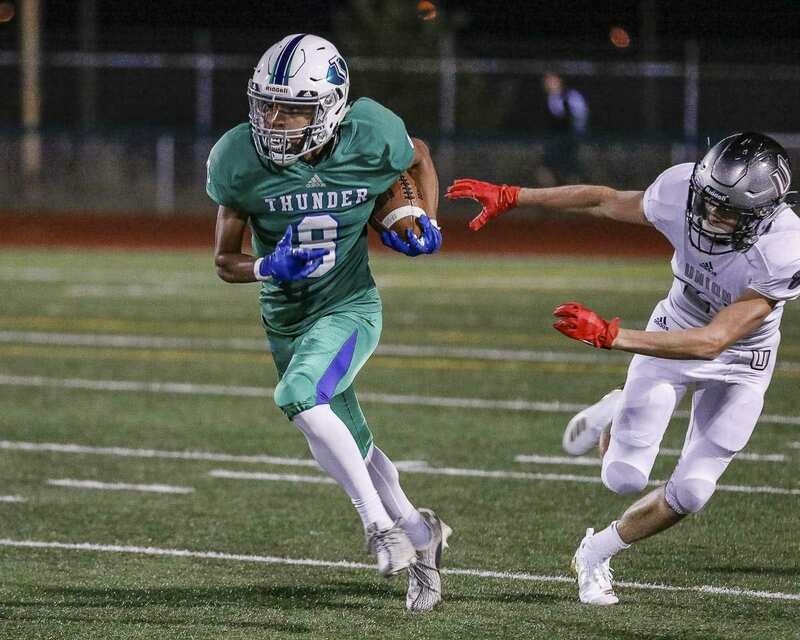 Next for Evergreen is a long trip to Lakewood. No, not Lakewood, Washington, but Lakewood High School in Arlington. “The six-hours-away Lakewood,” Hyde said. OK, technically, probably not six hours. But one must go through Seattle on a Friday so it can be anywhere from four to 14 hours, right? Yes, it will make for a long trip, but there is a reason behind the trip. 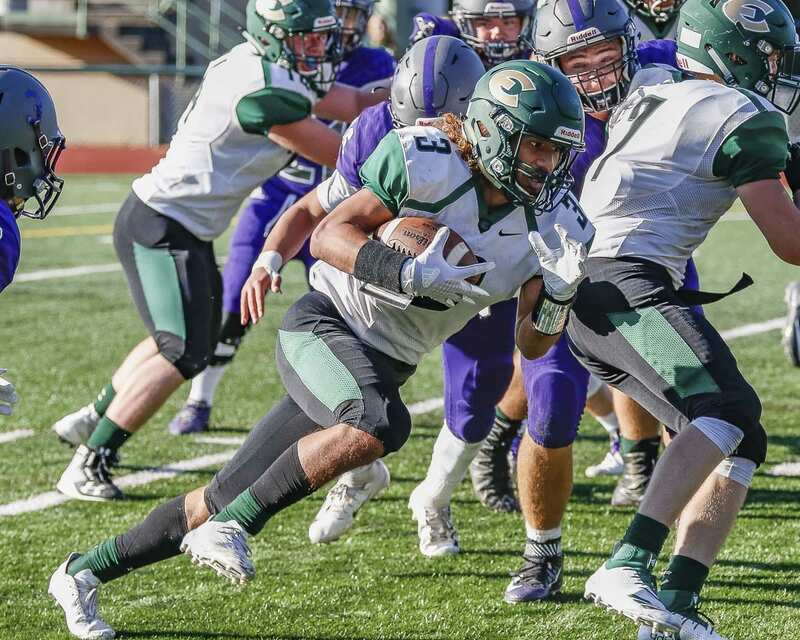 If Evergreen is to make the playoffs, a road trip is a distinct possibility. So far, he likes the growth he has seen in his team this season. The Eagles were down 24-0. They were down 31-7. They would end up losing, but they did not stay down. That is one of the biggest takeaways of last week’s game for the Bay coaching staff. These players refused to give in, even in a tough situation. That 31-7 deficit? It turned into a 31-28 deficit late in the game before Heritage got one final score. After reviewing the game video, the coaches saw inconsistent play. The Eagles turned the ball over too many times to expect a different outcome, Lions said. They lost the field position battle. And in a hole all night. “Amidst all of the reasons to quit or point fingers, our coaching staff and players remained focuses on what we can control,” Lions said. 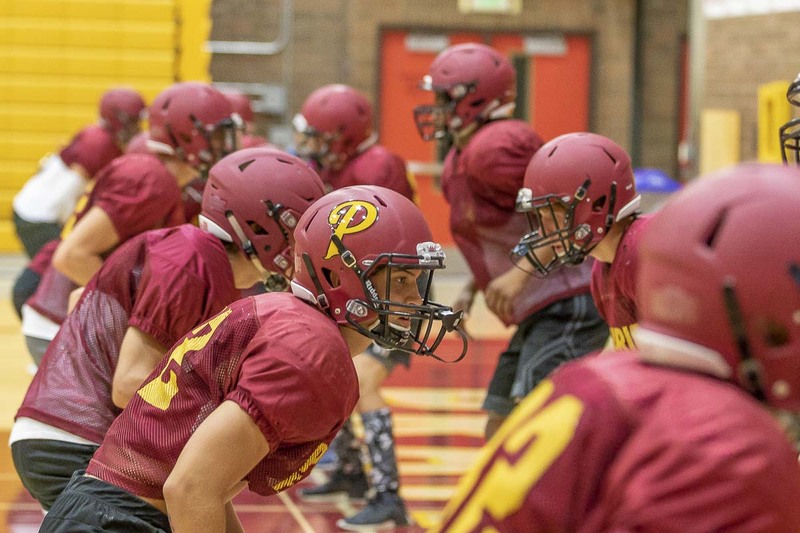 Lions was particularly impressed with the play of the offensive line: Logan DeGrandpre, Levi Grahnert, Victor Montes, Gabriel Ortega, and Malek Mabrouk. “They are becoming the offensive line we know they can be, and each week they are improving the little things,” Lions said. For a combination of play and leadership, Lions pointed out Akilotoa Kaumatule and Carter Morse. 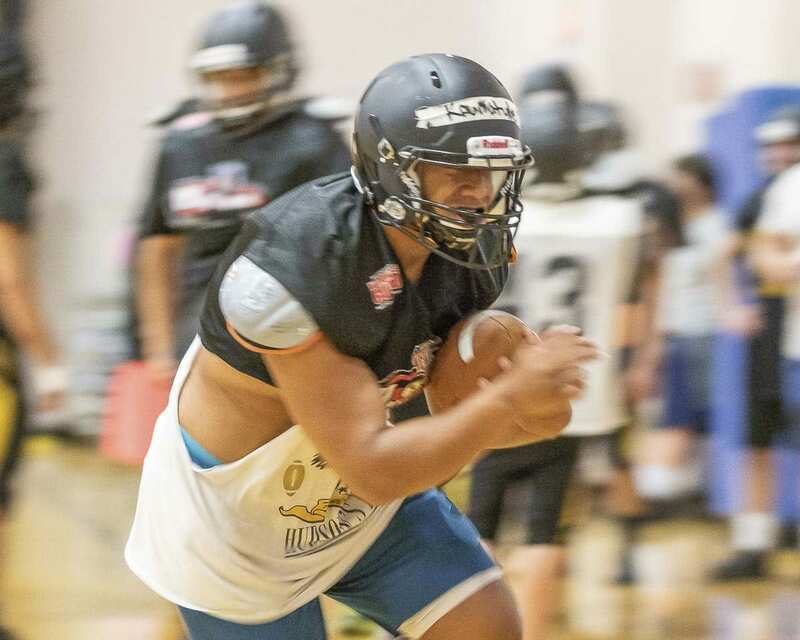 Kaumatule runs like “Beastmode,” which picks up the morale and energy of the whole team. Morse, the coach said, is a tough matchup for any opponent with his athleticism, physicality, and field awareness. “He made all the catches look easy and worked hard to finish each one,” the coach said. The Trappers did not score in Week 2, but did impress their opponent.